Can you discuss the different functions of artport as they have evolved over the years, ranging from commissioning works and gatepages to exhibitions and archiving? How have these functions come together, or how have they shifted? It's a great question since the evolution and focus of artport mirror shifts in net art practice and in the cultural landscape of the web over time. Artport consists of several sections, at least one of which has become an archive. In the late '90s and early 2000s, splash pages—pop-up landing pages from which the users could move on to the main content of a site—were a trend, so artport's "Gatepages" were originally conceived as either splash pages to an artist's website or new online project, but occasionally became elaborate mini-projects in themselves. Needless to say, splash pages at some point vanished—among other factors, they fell victim to the increasing use of pop-up ads and the consequent resistance to them and default blocking of pop-ups in browsers—so the Gatepages section effectively became an archive of an outdated format. I quite like the Gatepages archive for precisely that reason—it is not only an archive of mini-projects created between March 2001 and February 2006, but also a testament to the cultural vernacular of web expression at a certain time. Some of that early language of the web has become folklore and experienced a comeback; it is fun, for example, to look at Wolfgang Staehle's artport Gatepage from 2001 and compare it to the retro-aesthetics homepage of a "postinternet" artist such as Petra Cortright. The "Exhibitions" section of the site has also seen cultural changes. It is both an archive of the projects that were included in on-site exhibitions of net art (the 2000 and 2002 Biennials, which had net art sections, and Data Dynamics in 2001) and of the "CODeDOC" exhibition, which was purely online. Content aside, the "Commissions" section of artport has not changed that much and commissions will continue on an irregular and ongoing basis. I very much enjoyed the process of collaborating with Tate on three commissions in 2006: Golan Levin's The Dumpster, Marc Lafia's and Fang-Yu Lin's The Battle of Algiers, and Andy Deck's Screening Circle. It just made sense to join forces at the time, and I liked the idea of an institutional network behind the commissions. It would be nice to see more collaboration between institutions in networked space. In 2009, we started a new ongoing commission series called "Sunrise/Sunset," which consists of net art projects that temporarily take over whitney.org only at the time of the sunrise and sunset, in New York City. Rafaël Rozendaal's Almost There launched on May 1, 2015. Occasionally, web visitors arrive at the site precisely at sunrise or sunset and then write us e-mails informing us that our website is "broken;" I like the idea of giving artists an opportunity to literally take over the (online) museum space. At some point, Sunrise/Sunset no doubt will be another mini-archive of a discontinued format, similar to the gatepages, but I also see these archives as snapshots of a moment in the life of the web. 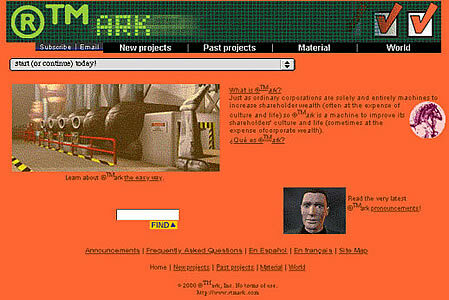 Website of RTMark (1997-). 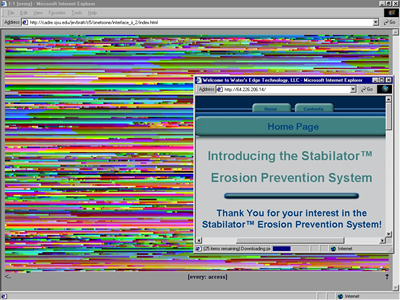 Screenshot c. 2000. In a sense, artport has grown up parallel to the maturing of net art into what is now a highly diverse field of practice. For instance, it began in those bubble days just prior to the backlash against the term "new media" that is reflected in Lev Manovich's 2001 use of the term "post-digital" (channeling Rosalind Krauss's "postmedium"), the 2003 Tate panel you were part of entitled "When New Media Was New," the Banff Centre show curated by Sarah Cook & Steve Dietz in 2005, "The Art Formerly Known As New Media," and subsequent uses of the term "postinternet." What shifts have you seen in net art since artport's founding, and how are they reflected in the collection? You're right, net art has evolved and changed tremendously over the past fifteen years alone, and some have argued that it has ceased to exist—at least as the "pure," exclusively online work experienced on your home computer that we saw in the 1990s and early 2000s. I would agree with the latter part. Net art increasingly became networked art, for example by branching out onto mobile devices and becoming available as an app that might work in conjunction with an installation or other offline components etc. These changes are embedded in artport's evolution. Some of the projects featured on the site have become apps, for example Scott Snibbe's Tripolar or The Battle of Algiers. As I mentioned, artport from the beginning documented exhibitions of online or digital art in the Whitney's galleries, but it increasingly became an online gallery space for commissions of net art and new media art, featuring Scott Paterson's and Jennifer Crowe's Follow Through (2007), a performative tour of the Whitney's collection that was accessible on mobile devices, or Will Pappenheimer's AR project Proxy (2014). Social media platforms completely changed the web, and commissions such as Jonah Brucker-Cohen's and Katherine Moriwaki's America’s Got No Talent, a visualization of Twitter feeds for reality TV shows, reflect that change. The practice of many, if not most, artists who work with the digital medium today is extremely hybrid. They may create online projects but they might also do object-based art, paintings or sculptures that are deeply informed by or use elements of the net or its "language," which is what the term postinternet tries to capture. I have issues with the term since it postulates a temporality that simply doesn't hold up—we are by no means "after" the internet—but it still captures a very real and important condition, a fusion of the material and immaterial that is different from anything we have seen before. The Internet of Things and James Bridle's New Aesthetic are both expressions of that. (Sadly I now frequently see postinternet used as a catchy term for art made by anyone born roughly after 1985 or for a sensibility characterized by an uncomplicated reverence for fame and success.) Artport no doubt will morph once again to incorporate aspects of what we now call postinternet practice while still being on, in, and beyond, rather than post, the net. John F. Simon, Jr., Every Icon (1997). Screenshot of software-based artwork. Before you came to the Whitney you earned your PhD at Düsseldorf University where you wrote about Herman Melville and Thomas Pynchon, then wrote a hypertext companion to TS Eliot's Wasteland in the mid-90s; around the same time, you were founding Intelligent Agent, which in its first iteration was a paper-based, full-color, highly intellectual, highly regarded publication on art and technology. How do you see your own transition from fiction to the poetry of code and towards the media arts? You also continue to be one of the most prolific and rigorous scholars in the field, balancing curating, art historical research, criticism and teaching. I know you never take vacations. What does the horizon look like for you? The path that led me, along with many other people, into new media art was research into theories on hypertext and networked reading and writing which gained momentum in the late '80s. One of the side effects of my work on Intelligent Agent was that I was frequently asked by museums and curators to consult on curatorial practices for new media art. It finally came to a point where I realized that I might as well curate and organize those exhibitions myself. My background in literature is definitely directly connected to my interest in code as a form of creative writing and in digital storytelling: I teach a course on Experimental Narratives at The New School's School of Media Studies where I am a professor. I am very interested in the new kinds of materialities we see emerging right now as our physical environment is infused by digital technologies and starts "waving back at us." As to what's on the near horizon: continuing to build artport and the Whitney's media arts programming; and I will have exhibitions opening at Borusan Contemporary in Istanbul in September and at the Pratt Manhattan Gallery in December. And definitely more vacations. After thirteen years in existence, artport has now been recognized with the status of a full-fledged collection, equal to painting or photography, within the Whitney Museum. Among other things, this endowed artport artists with the same legitimacy that the artists in the rest of the collection already had. (Indeed, it was fun watching everyone post their Lifetime Artist Membership cards on Facebook as they arrived in the mail and then seeing them all at the private opening of the museum's beautiful new building, finally feeling legit.) How would you describe the significance, within the Museum and within the international art community at large, of artport being recognized with this enhanced level of credence? I think artport's new status as a special collection was a very important step for both the works featured on the site and the recognition of net art(ists) in general. The Whitney's curatorial team had in-depth discussions about how we would approach this relationship with the collection, which has significant ramifications for the ways in which we think about net art in institutional contexts. There is a major difference between commissioning works and acquiring them for a collection. All of artport's projects were commissioned under non-exclusive licenses, meaning that the Whitney Museum has the right to exhibit them in perpetuity and hosts projects on its server, but that artists are still able to retain copies and show their works in exhibitions with a credit line stating that the respective piece was commissioned by the Whitney. The Whitney does not have exclusive ownership of artport projects, which brought up the question of whether we needed to officially acquire all of the pieces to bring them in to the collection. After discussions within the curatorial team, we decided that it does not make sense to "lock down" the works as acquisitions. While I believe that net art can and should be collected—Rafaël Rozendaal's Art Website Sales Contract, for example, is a very sound model—acquisition didn't make sense for all of the artport projects. Many of the gatepages, for example, are artistic gestures that can easily be copied and appropriated by anyone. They are significant as artworks, but making claims for their exclusive ownership seemed like a violation of the characteristics of the net and the digital medium. We therefore chose to take a hybrid approach that makes artport an adjunct of the collection: all the works maintain their non-exclusive status but, at the same time, artport as a whole became associated with the collection. The "artport collection" is now given the same administrative purview as the Museum's collections. This means that all of the artists are treated as collection artists and that we are committed to preserving their work. Carol Mancusi-Ungaro, the Whitney's Melva Bucksbaum Associate Director for Conservation and Research, has been very supportive of net art's preservation and has also spearheaded the conservation initiative devoted to preserving Douglas Davis' online project The World’s First Collaborative Sentence, which was donated to the Whitney in 1995, but remained the sole piece of net art in its collection until artport became part of it. Bringing artport into the collection makes the statement that net art as a medium has the same status as traditional art forms. Not all of the artists that contributed to artport are exclusively "net artists;" they may also be painters or sculptors and work across a range of media. Bringing their web projects into the collection means that they are as important and collectible as a painting or sculpture.